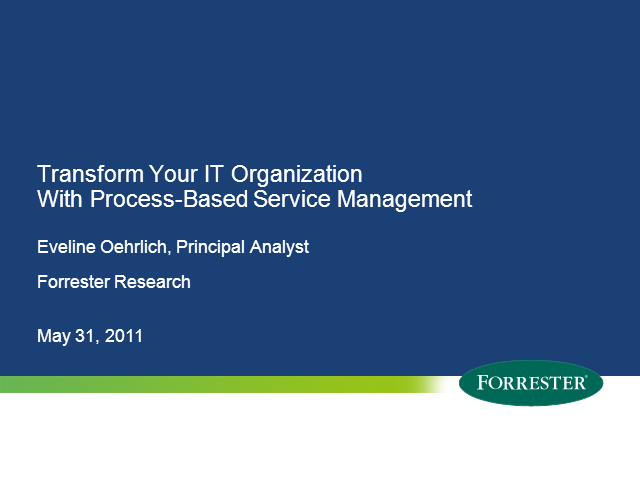 Ms. Eveline Oehrlich, Principal Analyst at Forrester Research, will discuss how a process-based approach to ITSM can help IT organizations transform themselves into true service providers. This webinar will discuss the key processes which are necessary for transforming your organization. Featured Speaker: Ms. Oehrlich is a Principal Analyst at Forrester Research, serving Infrastructure & Operations professionals. With more than 20 years of experience working with IT organizations in the definition and development of IT service delivery processes, her current research focuses on ITIL, the implementation of IT service management from a holistic or partial perspective, business service management (BSM), and many other aspects of IT operations. Eveline came to Forrester from Hewlett-Packard, where she served as director of competitive intelligence and value delivery chain program manager in the HP OpenView organization. She has a master’s degree in computer information systems from Colorado State University.